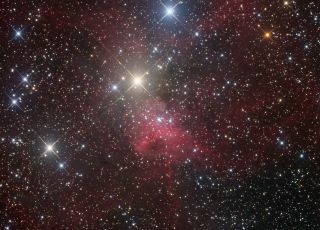 Astrophotographer Ron Brecher took this image of IC 417, known as the spider nebula, from Guelph, Ontario. The stunning view of the Spider nebula offers a cosmic web of celestial delights, and was captured by astrophotographer Ron Brecher in Guelph, Ontario. Brecher took multiple exposures of the distant nebula to collect enough light to create an image that would otherwise not be evident to the eye. Of course, the Spider nebula wouldn't be complete without it's nearby counterpart. "The 'Fly' lies nearby, and I might image it sometime," Brecher wrote in an email to Space.com. Brecher used a SBIG STL-11000M camera, Baader Ha, R, G and B filters, 10"ASA astrograph operating at f/6.8, Paramount MX. Guided with QHY5 guider and 80 mm f/6 Stellar-Vue refractor.